We all start our morning with a nice cup of Joe or cup of tea. Too many of us have known how important our caffeine morning routine is. I mean how many marketing materials and morning slogans are created around your morning cup of Joe! Make your brand a part of your customers and prospects morning routine with custom imprinted mugs. Custom coffee mugs have always been a top choice for companies to brand with their logos. Why is this promotional product so popular you may ask? It is used several times a day and seen by many people making its cost per impression very low. So why not give your clients, prospects, and employees something they truly enjoy. When giving a gift, perception matters and there is no difference in gifting for your business with promotional products. Here are 3 simple ways to package your personalized coffee mugs to make this already affordable promotional item a bigger hit. 1. Give your custom coffee mug ready to drink! What a better way to welcome a new employee, thank a customer, or get on the good side of a prospect then by giving them a nice logoed ceramic mug with a pack of coffee, cocoa, or a few bags of tea! They will be thankful and you will stand out from other companies. Now you are not just giving them a logoed mug, but rather a gift. 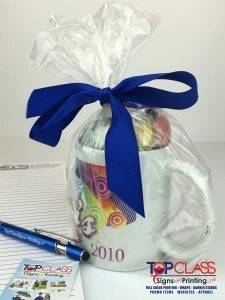 Who doesn’t want to receive a nice imprinted mug filled with candy. Buy some bags of candy or some chocolates, wrap your custom imprinted mugs and tie them in with bows. You are sure to wow anyone with this personalized gift. This is a great, simple and affordable corporate gift for the holidays, customer or employees’ appreciation days, or fill it with heart shape candy or chocolate as a Valentine gift. This is all about figuring out who you are giving to and the promotion you are using it for. It is okay to give a logoed mug by itself, but in that case make sure it is not just another boring, white ceramic mug with a logo on it. 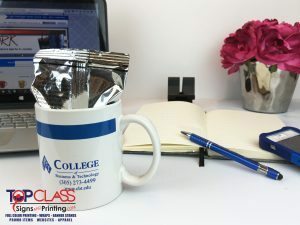 When giving a logoed mug alone make it a fun personalized coffee mug, a colored logoed mug, or a unique style logoed mug. Just like your branding and marketing you don’t want to be just another logoed mug, you want to stand out and be unique.